Lovingkindness in the Morning will revolutionize your life and allow you to walk in divine favor, prosperity and health. Change your days from the ordinary to the extraordinary, from labor to grace, from chaos to peace and from fear to love. Are you ready for a change in your life? If so, start experiencing God's Lovingkindness in your Morning. Shipping and handling is $4.00 for one book, $9.00 for two - three books, $13.50 for four - five books, $20.00 for six to ten books. For all orders that exceed ten, we will contact you for the specific shipping costs. 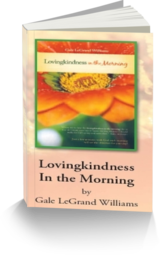 Order your copy of Lovingkindness In the Morning written by ECM founder, Gale LeGrand Williams! "I am usually not a big devotional fan but this book is different. The author has provided inspiration, wisdom and practical experience on how to improve your life and be closer to God all in 366 easy to understand and implementable pieces. This book has made a tremendous difference in my life and I highly recommend it for anyone." "If you are looking for a devotional that will increase your daily walk with God, "Lovingkindness In the Morning" is for you. It will make your time with Him more personal. So I encourage you to bless yourself with a copy as well as others in need of encouragement in their daily walk with Him."